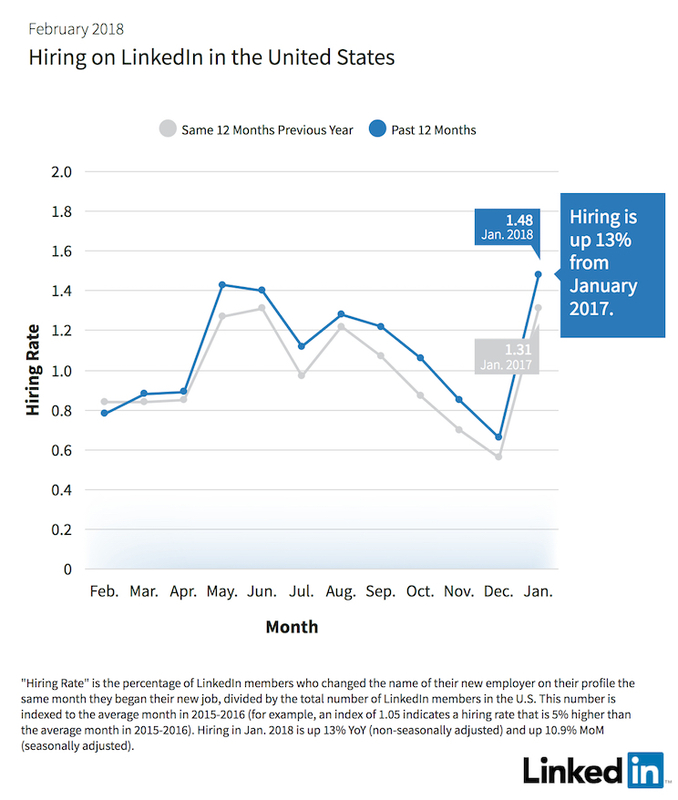 Hiring across the U.S. in January was higher than it has been since May 2017, with the manufacturing sector seeing the biggest year-over-year growth, according to the February LinkedIn Workforce Report. New jobs continued to be added in the aerospace and transportation and financial services industries as well. Seasonally-adjusted hiring (hiring that excludes seasonal hiring variations) was 10.9 percent higher in January than it was in December 2017. Accountants benefit most from the new tax bill – While hiring for accountants has been low compared to the national average in the past year, up only 7.7 percent compared to 13.0 percent nationally, demand for accountants has risen significantly in the past month. Seasonally-adjusted hiring for accountants in January was up 16.3 percent from December, compared to 10.9 percent nationally. This spike is likely attributable to the new tax bill, as the rise in demand goes beyond what is expected for the start of tax season alone. The cities with highest demand for accounting skills are Austin, Seattle, Norfolk, Raleigh-Durham, and San Francisco. Las Vegas economy maturing beyond entertainment and hospitality industries – Since February 2017, Las Vegas has risen from No. 9 to No. 4 on our list of cities gaining the most workers. This growth in people moving to Las Vegas represents a 44 percent increase compared to a year ago. So what’s driving this rapid expansion? The local economy is growing fast, the cost of living is relatively low, and, of course, Nevada has no state income tax. The skills with the most increased demand are software modeling and process design, farm and agriculture, immigration law, electronic and electrical engineering, and pet care and services. 2018 is off to an incredibly strong start for hiring – In January, hiring across the U.S. was 13.0 percent higher than in January 2017. Seasonally-adjusted hiring was 10.9 percent higher in January than in December 2017— making January 2018 the strongest month for hiring since May 2017. While it is too early to tell if this hiring spike is attributed to increased confidence from the new tax bill, the industries with the biggest year-over-year hiring increase in January were manufacturing and industrial (15.5 percent higher); aerospace, automotive, and transportation (13.2 percent higher); and financial services and insurance (12.5 percent higher). Click here to read of our February LinkedIn Workforce Report, including which cities are losing the most workers, and which are gaining the most. The LinkedIn Workforce Report helps workers better navigate their careers by highlighting workforce trends in the U.S. and across 20 cities. Insights include whether hiring is up, down, or flat, which skills cities need most, and where workers are moving to and from.